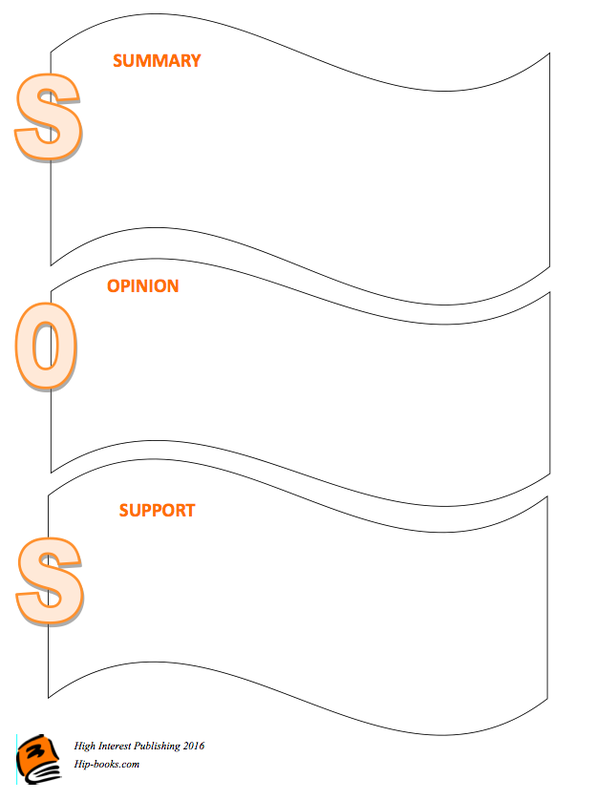 The SOS GRAPHIC ORGANIZER asks readers to SUMMARIZE what they’ve read, offer an OPINION about the reading and provide EVIDENCE from the text to support that opinion. Summarizing can be a very complex task for struggling readers – but an important one for all ages and content areas. Pick up Seven Tips for Summarizing. It’s easy to provide an opinion, but it’s more difficult to speak intelligently about that opinion! Teaching students some Words that Make You Sound Smart When You Talk About Reading can help them focus their opinions on the text and the writer’s craft. Support from the text often makes the difference between a weak and a strong response. Read Five Tips for Supporting Struggling Writers, including a generic rubric for assessing and teaching effective responses.